But before we had color photography to produce an image of plants, flowers, trees, weeds, leaves, etc, they were drawn, painted, engraved, etched, sculpted etc. Historically the earliest efforts to record plant likenesses seems to correspond to the domestication of plants – there is precious little if any paleolithic plant paintings on the inside of caves compared to the wonderfully detailed cave paintings of animals. They had the artistic chops – just no interest in painting plants – it was wall-to-wall big game buffalo, bison, and all manner of man and beast. Actually, it wasn’t until the fourth and fifth century BC that we start seeing plants being systematically drawn and painted and labeled with names and uses for the plants – herbals if you will. I mean, if a given herb has curative properties and you want to make sure you pick the right stuff – or better yet have your assistant pick the right stuff – it might not be a bad idea to draw a picture of the plant and describe it. The difference between a mushroom and a toadstool is the difference between life and death! Plant illustration ranges from the purely botanical to the purely artistic, from a drawing of a magnified root-section to a water-colour of a vase of roses. 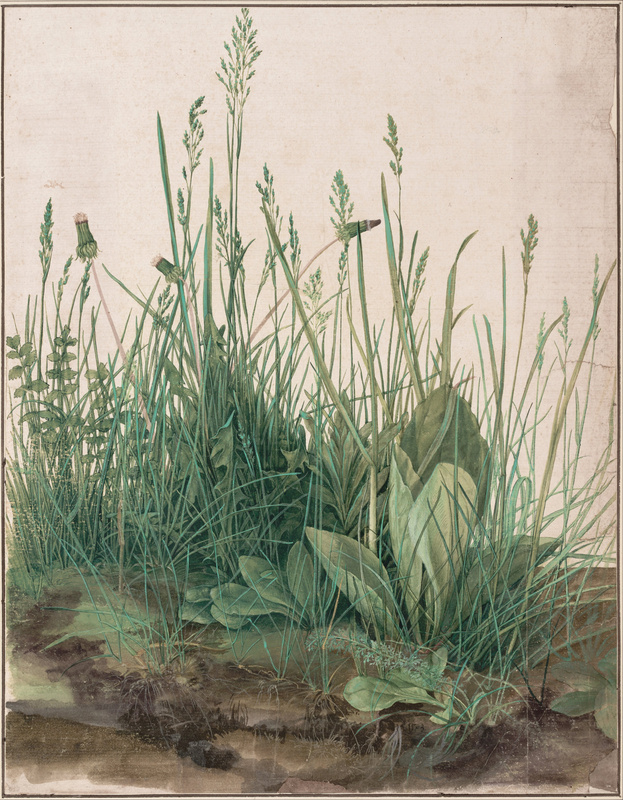 Between these two extremes lies a vast body of drawings and paintings with a combined scientific and aesthetic appeal – botanical records which are at the same time works of art. It is the history and development of this type of plant illustration that Mr. Blunt has, for the first time, explored and recorded in the present volume. … We feel that he has succeeded in writing a really valuable book which not only does full justice to the individual artists and their work, but also brings out, in a fascinating way, how developments in botany, for example the discovery and introduction of new species, and also advances in the techniques of reproduction, have influenced plant illustration throughout its history… This volume will, we hope, enable the many lovers of flower-painting and drawings to study and appreciate them in the future with a fuller realisation of their botanical and artistic significance. Besides the spelling of “color” and “realization” it is abundantly clear that this was written by someone from England. English authors have a wonderful command of English prose – I just love reading stuff by them and this book, besides being about a cool topic with tons of cool pictures, is all written in England-style English so it reads really well and is satisfying to read even if you don’t begin to care at all about flowers, plants, botanical stuff and don’t want to look at totally bitchen flower and plant pictures – the book has tons of color and b & w repros of cool botanical art stuff. 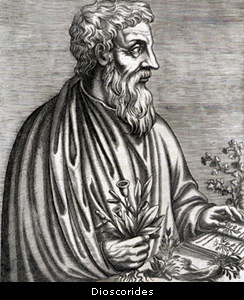 The motivator for the first fully illustrated systematic scientific / artistic treatment of botanical art was the ancient Greek physician Dioscorides (40 AD – 90 AD) who spent his professional medical career in the Roman army. He wrote a book on herbs and their healing powers, and botanical medicine in general which was the standard text used by Greeks, Romans, Medieval Europeans, Arabs and even all the way to distant India for 1500 years; the epic and all encompassing De Materia Medica. It was the major pharmaceutical treatise and was never lost or out of print. It was the book on the pharmacological properties of plants. De Materia Medica (Latin for “On Medical Material“) is an encyclopaedia and pharmacopoeia of herbs and the medicines that can be obtained from them. 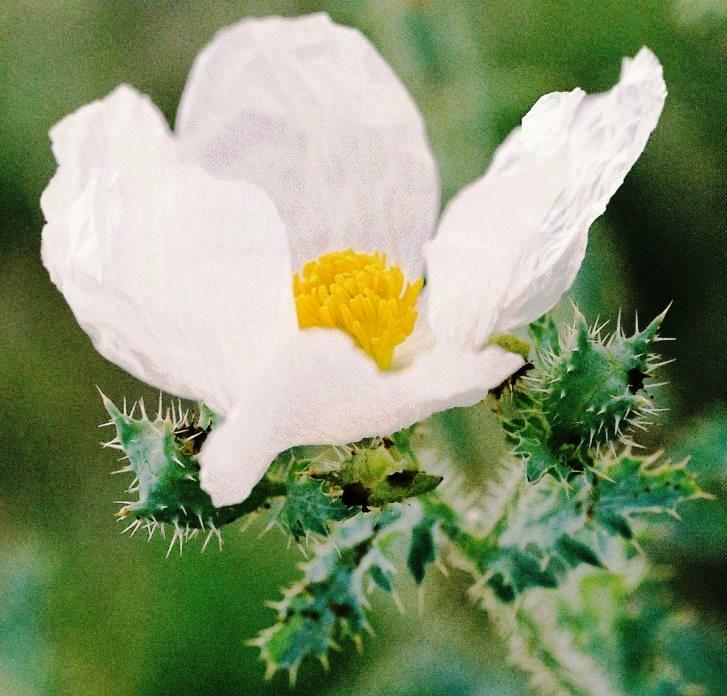 The five-volume work describes many drugs known to be effective, including aconite, aloes, colocynth, colchicum, henbane, opium and squill. In all, about 600 plants are covered, along with some animals and mineral substances, and around 1000 medicines made from them. The work was written between 50 and 70 AD by Pedanius Dioscorides, a Roman physician of Greek origin. It was widely read for more than 1,500 years until supplanted by revised herbals in the Renaissance, making it one of the longest-lasting of all natural history books. Interestingly though, the original De Materia Medica was not illustrated. The first illustrated version is called the Vienna Dioscurides and was done in 512 AD by an anonymous artist for the Western Roman imperial princess Juliana Anicia, the daughter of Emperor Anicius Olybrius. This version and others like it were copied over and over for hundreds of years – and the illustrations were mostly just copied. The idea of going out in the field and observing nature was foreign to the medieval scholastic mentality; and I would suppose that even though the illustrations were in the book, there probably weren’t that many copies made of it anyhow and a lot of the medical practice was most likely taught as an oral tradition. 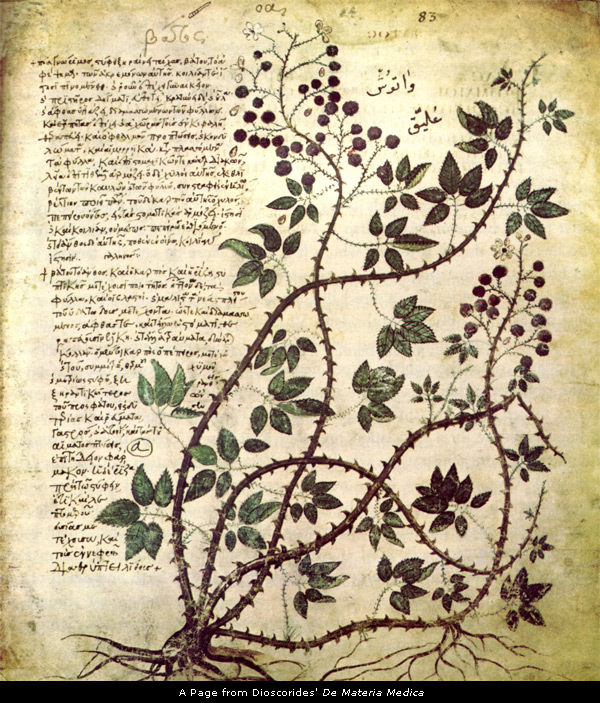 But as limited as the original De Materia Medica was, and as sterile and unoriginal the copies were, it was the first actual book describing plants and their healing properties and the Vienna Dioscurides was the first instance of botanical illustration – showing the plant with the aim of describing it’s appearance and it’s properties. OK, now we’re talking! Not only beautiful, but faithful, realistic works. Botanical illustration would eventually evolve in the directions pointed to by these two visionaries. This only takes us through chapter 3 of 24 – so there’s a way to go on reviewing The Art of Botanical Illustration, An Illustrated History With 170 Illustrations, Including 16 in Full Color by Wilifrid Blunt but we’ll keep at it!